As the Managing Director of a micro-business, I was hugely honoured to win one of the 15 main infocus female entrepreneur awards for my innovative research project, which had received NDA's R&D funding. Out of the 34 finalists, my decommissioning project, Viridiscope®, was the only nuclear entry. Women are under-represented in many UK industries, particularly the scientific and industrial sectors, so it’s really important to provide support through campaigns such as this, which was launched by the government’s innovation agency Innovate UK and targeted female entrepreneurs. I’m hoping that it will encourage even more women to seek funding support for their innovative ideas. The award brings with it a package of support and is worth £50,000. Viridian Consultants is a very small niche consultancy, just 3 of us but all highly specialised in our own fields of analytical science. We have developed an innovative laser-based portable tool that collects and analyses radioactivity in contaminated surfaces such as concrete, plastic, wood and brick. Viridiscope® began life as a PhD project at Imperial College London which was funded by the NDA and looked at bulk and surface monitoring of concrete. The project also received funding support from a collaborative funding initiative between Innovate UK and the NDA’s R&D portfolio in 2014 – they held a competition seeking innovative nuclear projects and we were lucky enough to be awarded more than £280,000 over 4 years. 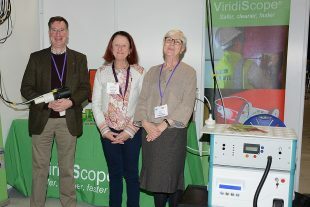 We’ve also been fortunate to receive funding for the first phase of Innovate UK’s ‘first of a kind deployment of innovation’ competition which means we can prepare a business case for eventually taking Viridiscope® to do field trials at several sites. We’ve already carried out one demonstration in a radioactive environment at Sellafield, which went extremely well. On top of that, we won one of the EDF Energy Pulse Awards which aim to showcase and provide tangible support to start-ups that are helping to shape the future. Our category was "Monitoring and Inspection Solutions for Energy Generation Assets". We’re also very much looking forward to working with OC Robotics on their successful bid to Innovate UK under the infrastructure call. They are planning a little robotic snake that can go down holes and we’ll be making a sampling head to fit on it. And finally, we’re also working on another feasibility study to develop a rugged, robust monitor that can measure alpha activity in real-time and in situ. Funding from all sources has been absolutely critical in helping us reach where we are today. Without it, we’d simply have had fantastic ideas that were doomed to remain just that: a piece of paper. Small businesses in particular sometimes need a funding lifeline to bridge the gap between concept and actual market-ready product. For us, the collaboration with Sellafield as a ‘test partner‘ has also been a vital part of the development. Ongoing funding is vital as it enables us to continue refining the ‘product’ to the stage where it’s ready to be used on a commercial scale. This cash award, along with the business support, is a huge boost to us. We are now able to successfully deploy a laser beam remotely that collects surface samples of, for example, concrete from high-radiation environments. This is transported to a safe area nearby for analysis. It would be much faster, safer and far cheaper than the standard approach which involves drilling into concrete to take core samples and sending the material away to a lab. Also importantly, it reduces potential exposure for workers. As facilities are demolished in the decades ahead, there are likely to be several million cubic metres of concrete rubble to deal with, potentially contaminated with varying levels of radioactivity. All of it needs to be assessed and treated, then disposed of, so the savings are likely to run into £millions. We’ve been working with Sellafield and are really excited to be testing Viridiscope® at the Active Demonstration Facility later this month.